"Spacious, luxurious 53' 1 BR 1 BA houseboat located on beautiful Lake Mead. Experience sunrise, sunset and gentle breezes from one of four outside decks. Kayak, paddleboard or cool off with a swim all from your private dock! 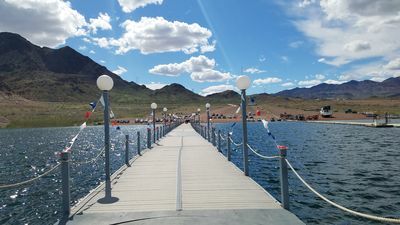 Relax and reconnect with the stunning beauty surrounding Lake Mead inside the canyon walls as you approach the marina and basin below. Begin your stay with a stroll down the walkway, then stop by The Boat House for casual fare and drinks overlooking the water and patio, along with a variety of vessels moored at the docks; you can also pick up a few provisions at the small store across the way. The friendly wildlife including resident ducks, birds, plentiful fish and longhorn sheep grazing on the hillsides will greet you upon arrival. BATEAU MAISON is located on a super-premium slip with southeast exposure off starboard (right side) of the boat and maximum views of both sunrise and sunset from stern to aft (front to rear). When you step aboard BATEAU MAISON you will enjoy a unique, one-of-a-kind hospitality with complimentary gourmet welcome basket that includes cheese, charcuterie and locally-sourced treats as you begin to your stay. Feel free to walk around and explore houseboat life while relaxing on one of 4 decks or climb upstairs to the "wheelhouse" and enjoy the BEST views from the Captain's chair as you chart your own course during your stay. 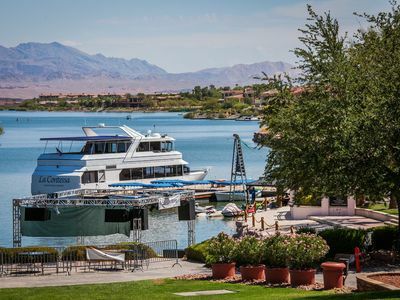 With so much to see and do, including Hoover Dam tours, boat, kayak and paddleboard rentals, swimming, fishing or a delightful dinner cruise next door at Las Vegas Marina, you'll soon appreciate the tranquil and cozy surroundings, as you make our houseboat, your home throughout your stay. We look forward to your arrival soon! Our beautiful little houseboat is located at the Las Vegas Boat Harbor at Lake Mead. It’s the perfect little getaway! Perfect for a romantic getaway for 2, or a summer retreat for 7. There are boats, jetskis and kayaks available for rent at the marina. There is a store and a restaurant located at the boat harbor and the marina. There is a laundry room and showers on the marina side that are accessible 24/7. The houseboat is located in a national recreation area. You will have to pay the enter the Lake Mead Recreation area. $25 for the week or $45 for the year. We do not allow the houseboat to be taken out of the slip. 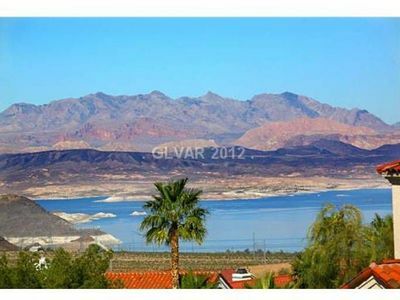 2Bedroom/1.5Bath With Amazing Views Of Lake Mead And Minutes From Hoover Dam. This is an upstairs flat in my private home with a private entrance in garage where you park and private deck. Beautifully appointed, meticulous with private swimming pool and outdoor barbecue kitchen (which may be shared with other guests on site.) Bring your boat or RV with you for off street parking, One indoor garage parking spot assigned for a vehicle/gear etc. We are 2 minutes to Lake Mead exit off of I-95 and 6 minutes drive to Hoover Dam. Drive 3 minutes to downtown Boulder City for quaint restaurants and shops (there is no gaming in town). 20 miles drive to Vegas for night time entertainment. Sleeps 4 people comfortably in beds + sofa sleeper in living room, additional cots available as well. Has additional refrigerator if needed. A second unit is available if your group is larger. Turnkey furnished, newly remodeled Casita with 1 king bed in main bedroom and 1 queen bed in 2nd bedroom and sofa sleeper in living room. Fully loaded kitchen, large living room with Wi-Fi, Roku and cable, with outdoor barbeque kitchen, swimming pool and Jacuzzi, There is one other vacation rental on the property Property which has both mountain and lake views. Additional outsiders not on the booking require prior approval and a fee to enter. 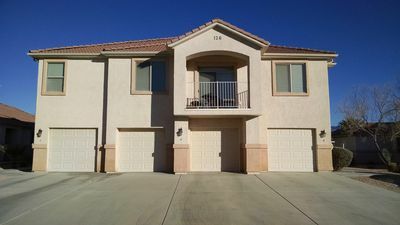 This property is really in Boulder City and as near to Lake Mead Recreational Area and Hoover Dam as you can be. Many listings will say Boulder City but they are really in Henderson or Vegas. If you desire a beautiful accommodation that is 30 minutes drive from McCarren Airport and provides a beautiful desert experience then this is the place. Many walking and hiking trails both in the mountains and through the historic railroad tunnels. 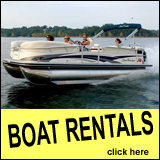 Tons of water sports on the lake such as fishing, kayaking, boating and boat rentals as well as dinner cruises. Bicycle paths galore and zipplines. Easy trip to the Valley of Fire State Park or Grand Canyon. Helicopter and airline tours to various places right from Boulder City Airport. 2 golf courses that are very affordable and lovely parks and green spaces throughout the city. You will be pleased! Boulder City Gem!Three bedroom home fully furnished to make your stay a comfortable one. Plenty of street parking as well as driveway parking . Wifi and Fire stick set up for television.Our home is 25 minutes to the Las Vegas Strip and minutes to Lake Mead and Hoover Dam. If you love antique shops Boulder City has lots of shops to browse in. Lots of local dining if you are wanting to stay in town there is something for everyone. Spacious 4500 square foot 2 1/2 acre home in a quiet country neighborhood. 5 large bedrooms with large closets, Large game room with a professional pooltable. There is a separate TV room with a fridge and microwave. Large covered porches with lots of seating with a Barbeqe.. More parking for your toys than you could use, Boat ,off road vehicles, trucks and trailers. 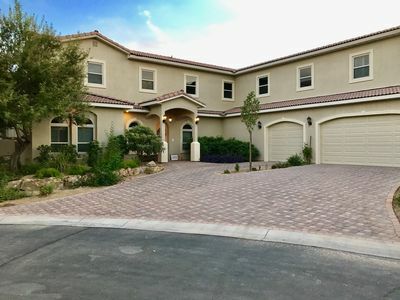 Only 55 minutes to Las Vegas, 45 minutes to the speedway, Minutes to the Valley of Fire, Lake Mead, Logandale Trails for hiking photoes or off roading. Beautiful red sandstone formations and sand dunes. I like to call this Disneyland in the desert. There are some awesome single track mountain bike trails, Hiking. Take some great desert photos. A personal offroad experience can be arranged. 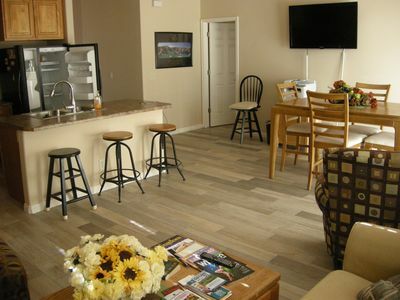 Elegant and clean two bedroom appartment in Boulder City Nevada. Beautiful two bedroom with new tiling and granite counter tops. Each bedroom has a comfy, queen size Certa Silver brand bed, as well as a sofa that can be converted into a bed. Rooms are decorated with original art pieces from assorted artists. Television included, equipped with Chromecast and WiFi. Also has as a carpeted 2nd story patio. 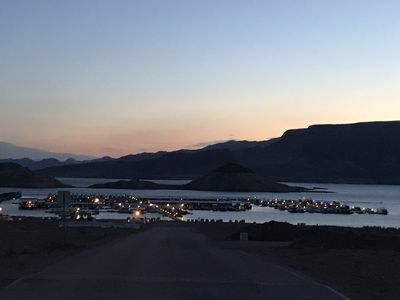 Local attractions include the boulder dam, beautiful lake mead, Colorado River, plentiful fishing spots, Lake Mead Marina, and Las Vegas Strip. Located in a friendly, quiet neighborhood. 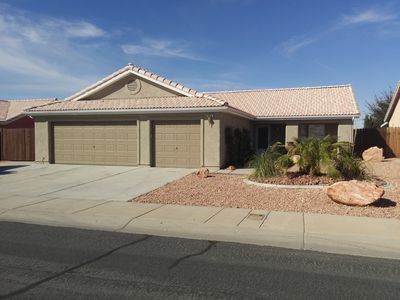 Newly renovated furnished home located in Boulder City. Minutes to Lake Mead and downtown Boulder City. 7 mins to local casino, 25 mins to Las Vegas Strip. This quaint little town has plenty of restaurants, bars, two casinos just on outside of city limits and plenty of other amenities to choose from. Close enough to the strip of Vegas but without all the traffic and crime. We put $40,000 + into this rehab so everything was new in Oct 2018. 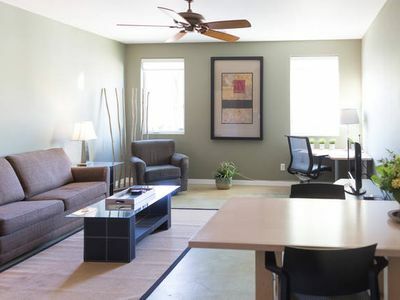 Wifi and printer is included and even laptop if needed for the light business traveler. You won't be disappointed in this home! Guests are sure to enjoy a memorable vacation in this fully furnished, 3 bedroom/2.5 bath residence. The main bedroom has a king-sized bed, while the remaining rooms are furnished with queen and king-sized bed, comfortable for sleeping 8 people. The stunning living room is furnished with couches and an entertainment center for your enjoyment. The kitchen is perfect for dining as it is equipped with an electric stove and oven and a full refrigerator. The property is just minutes away from all of Boulder City's best attractions and 30 minutes from the Las Vegas Strip. Guests are sure to get a true Nevada experience. 3 Bedroom Townhome with all the amenities! This beautiful 3 Bedroom townhome, is close to all the fun Mesquite has to offer. Mesquite is home to golf courses, movie theatres and casinos. It also is a minutes drive away from expansive ATV and hiking trails. It has a private patio with direct access to the swimming pool and hot tub. There are 3 bedrooms, 2 baths on the upper level with a half bath on the ground floor level and sleeps 6. Large kitchen w/ all utensils, linens, washer & dryer, flat screen TVs, DVD players and cable. Beautifully furnished 4 bedroom home in Mesquite, home has recent remodel new interior, exterior, and landscaping. Golf discounts included! Call Bret about rental or golf discounts and to confirm dates 8014943986 Quiet, clean, and upscale. Please read all my reviews and you will get the idea of how nice your experience will be. Centrally located in Mesquite. 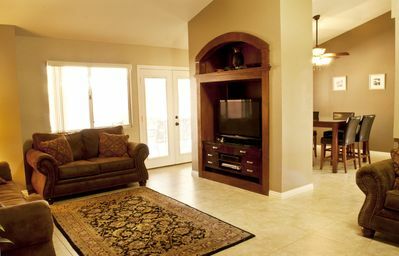 Home feature: granite counter tops, custom cabinets, new appliances, and tile floors with area rugs. Tile throughout the home except in 4 bedrooms. Why stay in a hotel, when you can rent an upscale 4 bedroom home, with a large furnished kitchen, washer and dryer, 4 bedrooms, 2 baths? Park your vehicles in a garage, beautiful private back yard with large covered patio. Enjoy the patio with the glass patio table with 6 padded chairs and have BBQ. Home has Wifi, large screen HDTV with surround sound, DVD and Satellite TVs. Purified water system, king bed in master bedroom, king bed in 2nd bedroom, queen beds in 3rd & 4th bedroom. Relax and enjoy, this home with all the comforts of a home, this is a fantastic way to travel. 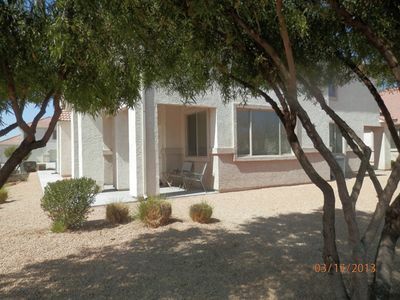 Centrally located and close to 8 golf courses in mesquite, just a 3-10 minute drive to each. 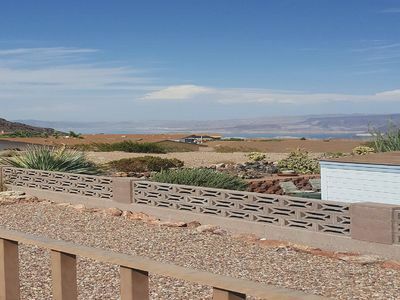 I am an avid golfer and can help you with discounts at many of the courses and provide you with local knowledge about the courses in Mesquite and St. George. This a home, not a condo, with no one above, below, or sharing a wall with you. The home is very private, quiet and no stairs. Covered patio, BBQ, patio furniture, and beautiful private backyard. Park your vehicles in the garage for added security. kitchen also is stocked with spices and condiments, and everything you want in a kitchen. Come and stay at this very nice cozy 2 bedroom deluxe condo. Each bedroom has a private bathroom and walk-in closet. Bedrooms are furnished with queen beds. TV's in each bedroom plus Wi-Fi. Clean fresh linens and bedding. Kitchen has dishes, pans, dishwasher, coffee pot, and toaster. Condo also has washer and dryer, iron and ironing board. Single car garage. Everything you need for a great vacation! Enjoy a relaxing evening in the swimming pool and hot tub. Clubhouse has an exercise room. Great walking path near by. Clubhouse Pool,hot tub.Wide Master Bedroom With Walking Closet, A front Balcony with sliding Glass Doors. (9' Interior Walls) open Kitchen with Island counter in center.Black Appliances. Washer/Dryer Included. Soft Water through out the Condominium. Ceiling Fan. New Furniture through out. Flat screen TVs in each room. with fold out queen size couch. Swimming Pool Outside with hot tub. Fitness Room in Clubhouse. 4 digit code is only given out day of check in, Free Wifi is included with this property. Beautiful 2 Bedroom + Loft, 2 Story Home, 15 Mins from the strip, 5 Mins from the Lake. Gated community, pool, biking trails, Mountain Views,close to shopping and movie theater. 2 Queen beds (Memory foam Gel) and pull out sofa in loft. This place comes fully furnished, flat screens, cable, WIFI, stocked kitchen and your own private backyard on corner lot. This house is great for vacationers coming to Las Vegas. 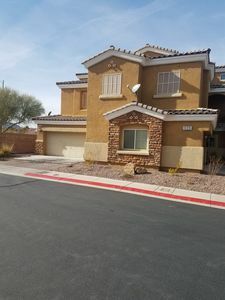 Our NEWLY REMODELED 2 bed, 2 bath GROUND FLOOR condo has everything you need to feel comfortable and at home while enjoying Golf, Casinos and all Mesquite has to offer. Located in The Springs, you will be able to enjoy community facilities: pool, hot tub, club house with fitness center, covered BBQ and picnic area. 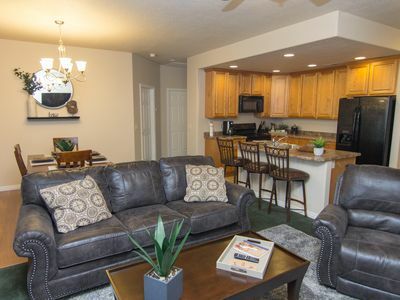 This 2 bedroom, 2 bath unit is tastefully decorated and includes Smart, Flat-screen TV, full kitchen amenities, full size laundry, and one car garage. High-speed internet and Blu-Ray DVD player are included. This penthouse is also on the end of the building with lake views from all the bedrooms and living room. 1817 sq. ft. All bedrooms are spacious. Has two 2 balconies, furnished with patio furniture. 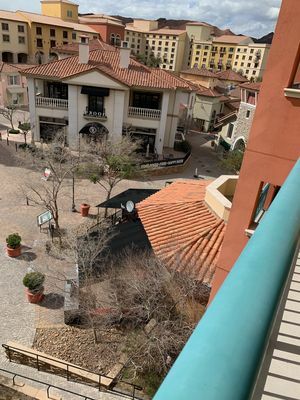 Address: 30 Strada Di Villagio #349 Henderson NV 89011 Check-in 4:00 pm Check-out 11:00 am **This is a new listing for us with this condo with little to no reviews at this time. We also have a 2 bed/2 bath condo (HomeAway Property ID 4475488) that you can search for and view our reviews for that unit to give you some reference how we are as owners and rent as well. In Condo Features: •Full Kitchen: equipped with a dishwasher, microwave, oven/stove, side-by-side refrigerator/freezer, toaster, coffee maker & blender. •Fully furnished • Master Bedroom 1: 1 King Bed, full bath, private balcony • Master Bedroom 2: 1 King Bed, full bath •Hall bedroom: 1 Queen bed • living room: pull out sofa bed (Queen) and queen air mattress •Flat screen TVs in family room & all bedrooms. PLEASE be aware & respect; this is a Smoke FREE and Pet FREE unit. We do not allow smoking on the balcony either, because the smoke will come into the unit. You are able to smoke outside of the building. Thank you! Resort Ground Features: •Elevator •On site laundry mat on basement level •Fitness room •Gated underground parking for one vehicle (first come first serve, there are not as many parking spaces as there are condos. All other vehicles and when filled, need to park in Casino parking) 2 Pool Areas: [Pool Area #1 Luna building - across the bridge]: •Swimming Pool with fountain feature •overflowing hot tub into the •heated lounging/kiddie pool •fire place with a view of Lake Las Vegas •plenty of loungers to relax on [Pool Area #2 Viera bulding]: •1 lap pool (heated) •1 large lounging pool •hot tub •plenty of loungers! 5 Minute walk to the Village across the bridge for access to: •Rentals for Paddle Boats, Canoes & Small Boats. •Season's Market Grocery Store & Cafe' •Restaurants •Weekend Entertainment •Golf Course •20 minute drive (depending on traffic) to the Strip ...15 minutes from TONS of shopping like Costco, Target, the mall, Nordstrom Rack & lots of restaurants (like Hash House A Go Go, Babystacks, Zuppas, Cafe Rio etc). If you have a boat, you won't want to miss exploring the Hoover can even take a walking tour on the top! Enjoy the resort lifestyle at this fully furnished One bedroom condominium with new hard wood floors, large Resort Style community pool. Outdoor spa, Playground, Fitness Center, community golf Course and more. Walk by the picturesque lake or to fine dining. shopping, casino and special events at the European style Montelago Village. We offer our luxious unit fully equipped with ac for those hot summer nights. WELCOME TO FABULOUS LAKE LAS VEGAS ! 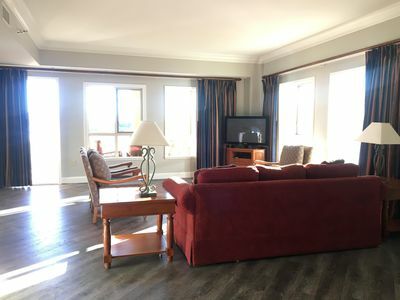 THIS 1 BEDROOM 2ND FLOOR CONDO WITH LAKE & VILLAGE VIEW HAS ALL THE AMENITIES OF A LUXURY HOTEL! THE UNIT IS A MODERN COMFORTABLE1 BEDROOM ,SPACIOUS LIVING ROOM ,KITCHEN ,WALK IN SHOWER UNIT THA CAN ACCOMMODATE A FAMILY WITH KIDS OR COUPLES. WE HAVE A GYM,LOUNDRY ,POOL , JACUZY , FIREPLACE OVER LOOKING LAKE Las Vegas AND MONTELAGO VILLAGE .JUST 20 MINUTES FROM LAS VEGAS ,LAKE MEAD, VALLEY OF FIRE AND HOOVER DAM. OUR VILLAGE HAS LAKE FRONT RESTAURANT,WATER ACTIVITIES CONCERTS ON THE LAKE . ENJOY! Escape the crowds to this incredible, peaceful getaway! 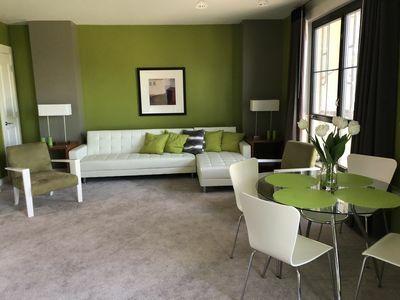 Our luxury condo has been meticulously remodeled from top to bottom with deluxe materials and designer finishings for your comfort and relaxation. Lounge on the deck and enjoy the incredible views of the lake, pool and village activities. Just a short drive from Las Vegas. 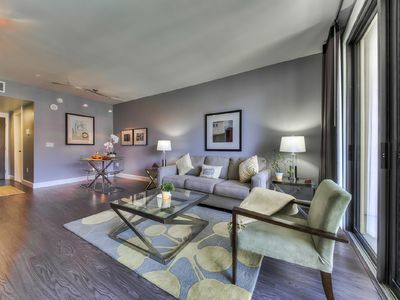 This beautifully remodeled condo is a step above the rest! Unlike most condos in the area, everything has been redone with your absolute comfort in mind! The views are spectacular, bedding is luxurious, luxuary lamenat floors throughout, equipped kitchenette, spacious bath and best of all, our housekeeper is meticulous! She will have the place sparkling for your arrival. As our guest, we want your stay to be absolutely spectacular! 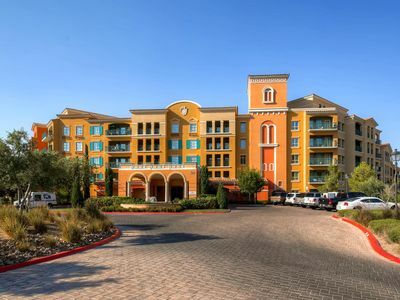 This is the Viera condominium located in Montelago Village at Lake Las Vegas in Henderson, NV. This is a 2 bedroom 2 bath unit that is fully furnished including complete kitchen, appliances and everything you need to feel at home. Master bedroom has a King Size Bed and second bedroom has a 2 Queen size bed. There are Flat Screen TV’s in each room for your viewing pleasure. Laundry facilities are included in the unit. The bathroom is spacious including shower and separate tub. The unit has 1049 sft of living space. Other amenities offered at the Viera are a fitness center, laundry facility, gated under ground parking, elevator, two pools, spa, Reflection Bay Golf Course, Lake Las Vegas boat rides, and MonteLago Village shops & restaurants. Lake Las Vegas is approximately 20 minutes from the Las Vegas strip. For locals, this is a great weekend retreat! Lake Las Vegas Vacation get away. Twenty minute from the Las Vegas Strip. Enjoy Lake Access to kayaking, paddle boarding, boating. Season’s grocery store is 5 minute walk from this beautiful condo. Restaurants, wine bar, and ice cream for your taste buds. 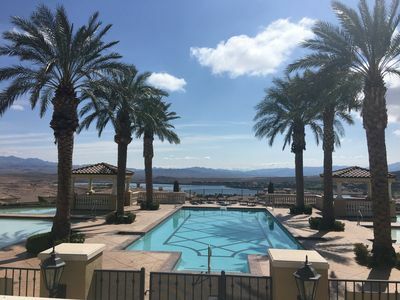 Lake Las Vegas is a Master Planned Resort community located minutes from the Las Vegas strip with a 320 acre lake with over 20 miles of shoreline. Two golf courses; one private Jack Nicklaus course located on South Shore is for Members and the 18 hole Reflection Bay golf course if located on North Shore and is also a Jack Nicklaus designed course. 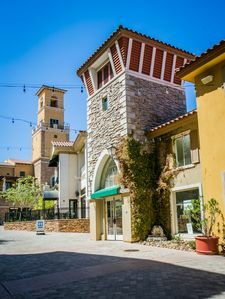 In addition to the shopping at Lake Las Vegas, the District in nearby Green Valley is a 10 minute drive from the lake as is The Galleria Mall. Of course gaming is available at the Fiesta, Sunset Station and Green Valley Ranch Casino. All three casinos are within 14 minutes of the Lake. Movie theaters with luxury reclining seats are available at Sunset Station. For the nature lover and hike, you will find several Rails to Trails hikes nearby. Spectacular views of Lake Mead on the Historic Railroad Hiking trail takes you through several tunnels along Lake Mead all the way to Hoover Dam. The spectacular Red Rocks are 35 minutes away and provide over 21 Hiking trails in the Red Rock Canyon National Conservatory. Waterfalls, unique plant life and desert critters provide interesting and beautiful sites along the trails. For the skier and snowboarder, Las Vegas Ski and Snowboard Resort is located at Mount Charleston and hour from Lake Las Vegas. For the spa enthusiast, their are two spas that provide therapeutic massage and skin treatments as well as steam, jacuzzi and relaxing rooms. 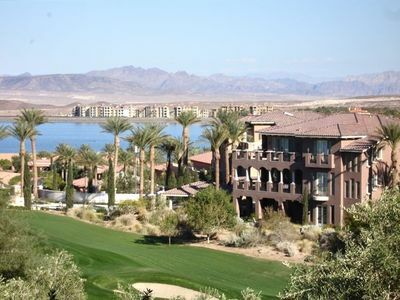 Lake Las Vegas Resort has everything for you! Let us help you create some memories! 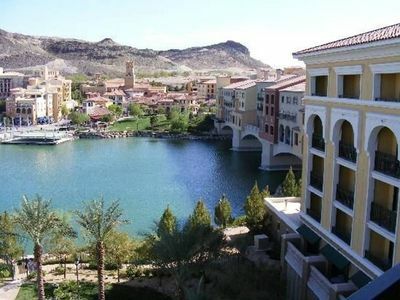 NEW LISTING: 2Br 2Ba Luxury Condo in the heart of Lake Las Vegas Village! 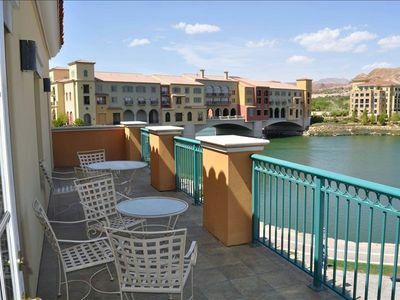 Beautiful and spacious two bedroom condo for rent in the heart of Lake Las Vegas. 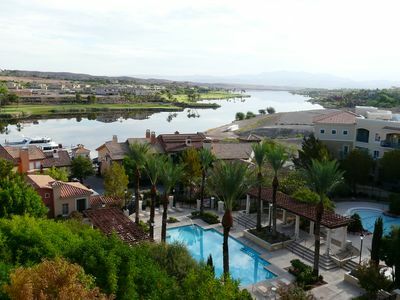 The property is situated in the V at Lake Las Vegas, a gated community, that overlooks the beautiful Reflection Bay golf course. The property is fully furnished and includes access to the clubhouse and 3 different swimming pools, hot tubs, fitness center, a billiards room and full outdoor and indoor kitchen with use at the pool. 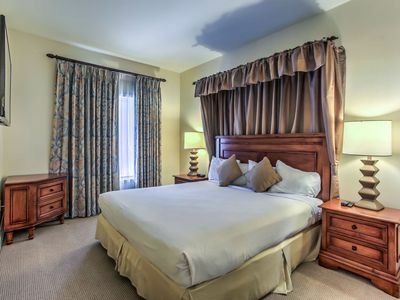 Only 20 minutes from the strip and walking distance to dining and golf. Two bedrooms, with a queen in the guest room and the master. Large garage and the patio overlooks the beautiful golf course. Located within 30 minutes of several golf courses, outlet shopping, water parks and the Hoover Dam! 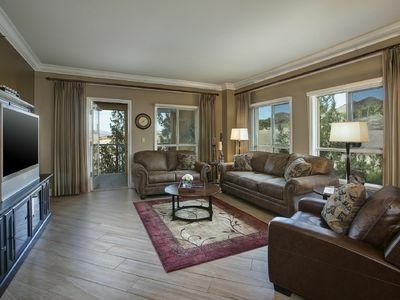 Ideally located lakefront condominium at fabulous Lake Lake Vegas. Located in Henderson NV, this fabulous resort offers endless options for recreation including swimming, boating, kayaking, jet-skiing, paddle-boating, water skiiing, and fly-boarding! Other outdoor activities include golf, hiking, bicycling, and more. After your day, enjoy the amenities of Monte Lago Village. Shop for your groceries at Seasons Market, or enjoy a meal out at any number of the restaurants and bars. For those seeking the lights of the Las Vegas Strip... it is just a 20 minute drive to the west. This one-bedroom condominium features a bedroom with king bed, living room, sleeper sofa, full kitchen, bathroom, satellite TV, air conditioning and heating, and free Wi-Fi. All guests are offered complimentary parking, use of the fitness room, on-site laundry, two gorgeous outdoor pools, and jacuzzi. We invite you to enjoy the comforts of home while relaxing and enjoying your vacation at the lake. You may check for available dates using the calendar...which is always up to date. Enter the number of guests, and click on "view details" to see the cost breakdown. To make a reservation click on "Book" and we will respond within 24 hours. Guests may be subject to a background/credit check. Security Deposit and signed rental agreement are required. You must be 21 years of age to check-in. 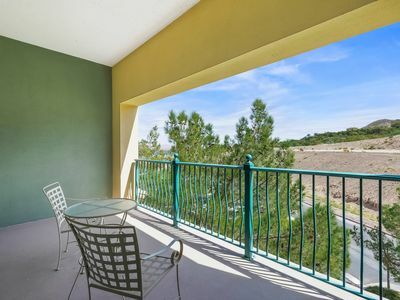 Ideally located lakefront condominium at fabulous Lake Lake Vegas. Located in Henderson NV, this fabulous resort offers endless options for recreation including swimming, boating, kayaking, jet-skiing, paddle-boating, water skiiing, and fly-boarding! Other outdoor activities include golf, hiking, bicycling, and more. After your day, enjoy the amenities of Monte Lago Village. Shop for your groceries at Seasons Market, or enjoy a meal out at any number of the restaurants and bars. For those seeking the lights of the Las Vegas Strip... it is just a 20 minute drive to the west. This one-bedroom condominium features a bedroom with king Bed, living room, sleeper sofa, full kitchen, bathroom, satellite TV, air conditioning and heating, and free Wi-Fi. All guests are offered complimentary parking, use of the fitness room, on-site laundry, two gorgeous outdoor pools, and jacuzzi. 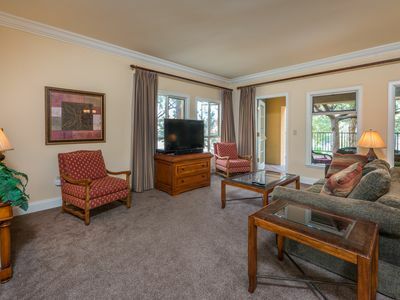 We invite you to enjoy the comforts of home while relaxing and enjoying your vacation at the lake. To check availability, select your desired dates on the calendar. To book a reservation, click "Book". Guests may be subject to a background/credit check. Security Deposit and signed rental agreement are required. You must be 21 years of age to check-in. Large 1305sf two bedroom villa sleeps six and offers all the comforts of home. This beautifully furnished villa has one king and one queen bedroom each with their own bath. Living room has a new comfortable sleeper sofa. Fully equipped kitchen with eating areas at the dining table, granite counter or balcony. Comfortable seating in the living room with a large flat screen TV and DVD player. Flat Screen TV and DVD player in each bedroom. There are no hidden resort or parking fees. There is a $300 damage deposit which covers lost keys, abnormal cleaning fees and damage to the property. Damage deposit is refunded after inspection of the property upon check-out. VRBO charges renters a fee based on a percentage of the base rental; owners do not receive any of this fee. Beautiful lake and mountain view from the balcony. Property offers heated adult outdoor pool, spa tub, children's wading pool and 24-hour fitness center. Viera Private Residences is a secure building with key access required for underground parking, pool, and fitness center. Famous Reflection Bay Golf and Beach Club (Jack Nicholas Signature Course) is located just across the lake. The Village features restaurants, Season's Market, specialty shops, and live music on Saturday evenings. The Marina offers Gondola rides, boat rentals, kayaking, standup paddle boarding, and water jet powered flyboarding. Bike or hike the beautiful scenic desert trails. Visit LakeLasVegas.com/Events to find out what is happening in the area during your stay. So much to do - located just one mile from the entrance to Lake Mead National Park, and a short drive down Galleria Parkway to Cowabunga Bay Water Park, Galleria Mall, Galaxy Luxury Theater, Costco, and plenty of great shopping. 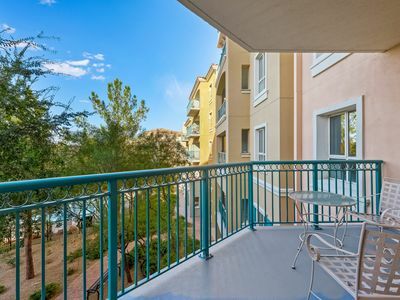 This lake view condo is nestled in the heart of Lake Las Vegas Resort at the Montelago Village has been fully renovated, including an in unit WASHER/DRYER. The only 1 bedroom in Lake Las Vegas with in-unit laundry. This charming 700 square foot condo offers one bedroom and one bathroom with a living room, full size kitchen and dining area. 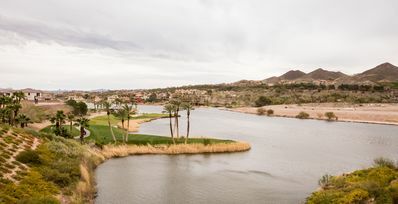 It also features a large 150 square foot veranda with views of Lake Las Vegas, the 18th tee of the Reflection Bay Golf course, mountains, courtyard/pool, and the village. There is secured underground parking. The condo is professional cleaned/managed and maintained to hotel quality standards. The living room offers comfortable seating for 4 with a Flat screen/smart TV with NetFlix/Amazon, dvd player, Dish Network HD/DVR, wireless/wi-fi high speed internet. 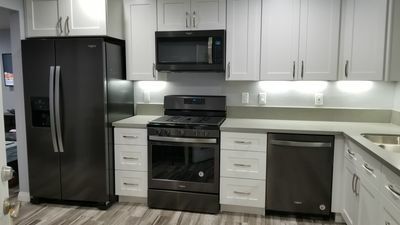 The fully equipped kitchen offers a gourmet 5 burner samsung range, upgraded Kitchenaid microwave and full size refrigerator/freezer and granite counters.The dining area has a table with seating for four people. The oversized private veranda has comfortable seating for 6 on the sectional sofa to relax while taking in the breathtaking views. 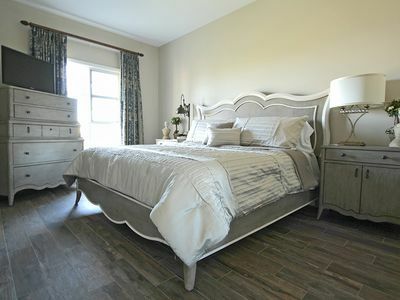 The master suite has a king size bed, flat screen TV and attached full bathroom with a soaking tub and separate shower. This condo is located steps away from the the village restaurants, pubs, shops, grocery store and marina. There is also access to an exercise room. The photos in my ad are the actual views from the patio and not the stock Lake Las Vegas photos others use. 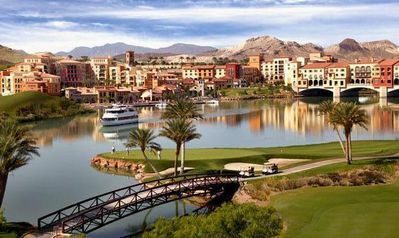 Keywords: Lake Las Vegas, Lake view, Montelago Village, Viera, casino, restaurants, Marina, kitchen, large patio, king bed,Wireless, Wi-Fi, Corporate rental, relocation, Westin, Ravella Spa, Hilton, Golf. 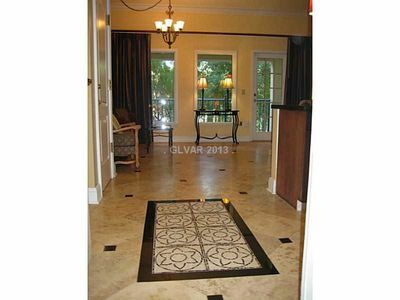 Viera Private Residence Montelago Resort.. Condo is in a Secure enclosed Building for your safety. Total $1645 1st month. Beautiful Tuscan Resort !! Lake Activities for the Parents and Kids !!! Book Early to save your place - This is the Desert so it does get Cool in the Winter about 65 f and the Village is quiet. Deluxe Large luxury condo - Large 760sq of luxurious space! Much Larger than most Condo's - 1 Bedrooms 1 Bath - Lots of light due to many windows. 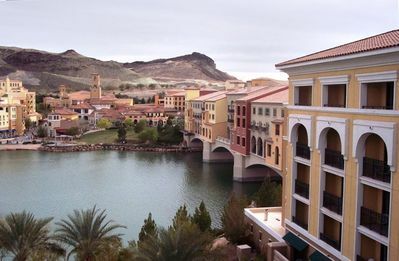 Designed to replicate the Tuscan Hillside of Italy, Lake Las Vegas is only 17 mi away from McCarran Airport and the Strip, 'The Entertainment Capital of the World,' but its peaceful atmosphere creates a relaxing experience. DishTV 200 channels + local Channels. Let the mesmerizing view of the mountains, sparkling lake, and some shopping and Food. -Out of Town peaceful!! 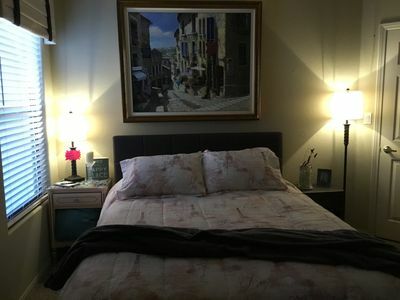 Yet less that 20 minutes to the Downtown Strip -Sleeps up to 2 people (King bed in MBRoom, Queen pullout sofa in Living Room) -Large, private bedroom, spacious living and dining areas, beautiful bathroom, Soaking tub and shower. -Fully equipped Kitchen - Dishes, coffee pot, toaster, Ironing board and Iron, Hair dryer. -Balcony with table and chairs - Laundry Facility and gym on 1st floor - Pools, hot tubs, activities on the Lake. -Activities Occasionally in the Village, on Weekends -Summer Concerts in the Park. -Winter (Nov/Jan) Ice Skating in the Village. -Restaurants, in the Village - paddle boats etc rentals for the kids. -Lake Mead is only 2 miles farther on Lake Mead Parkway - Go even Farther and see the Hoover Dam. OK Pool open in April each year 10am to 10pm, only Lap Pool 80 Degrees, Spa 101 Degrees other pools may not be heated. Rent $1380 Per Month Security $200 Refundable if not Damage and Keys are Returned ! Total $1645 1st month (Refundable Security Deposit) Utilities $ FREE, Taxes are included, and no Resort Fees. Total $1645 1st month There after $1380 per month. Deposit: to hold your room is $200 and must be received within a week of booking. Balance: Received Full Balance - must be received 60 days prior to date of rental check In. 3.Payments Options: VRBO or 1. Use Citi EPAY or Chase QuickPay (To Send money from your Citi or Chase account to my Citi or Chase account, this is FREE of charge for both of us) !! Many Banks do this transfer now, Please check with your Bank..!!! 2. Or Personal Check as long as it is been at least 60 day prior to start of rental, so it will have time to clear. Rental agreements must be filled out and sent to me 60 days prior to occupancy. Required by the Lake Las Vegas Resort. All fee's included: Tax + Gym + Utilities, the Exception to this is that the Tenant must replace (supply & install) any bad light bulbs. And replace any broken Items, see Walmart *At Checkout MUST return Gym keys to Condo kitchen Drawer and Door Key at Front Desk at check out. Or will loose your Security Deposit $200. Refund/Cancelation: must be 60 days prior to move in. Maximum Occupancy: 4 persons Keywords: Lake Tuscan Resort Montelago Village 4 STAR's has shopping and some restaurants to chose from and many activities to also to chose from. Concerts in the Park, Lake activities. The master suite boasts a king size bed, flat screen TV and attached full bathroom with a soaking tub and separate shower. 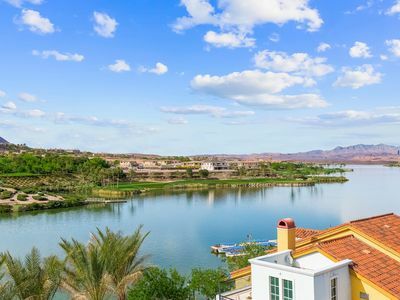 This villa is conveniently located near the village restaurants, pubs, shops and marina Keywords: 30 Stada di Villagio # 414 This lovely villa is nestled in the heart of Lake Las Vegas Resort at the Montelago Village. This charming 670 square foot villa offers one bedroom and one bathroom with a living room, full size kitchen and dining area. It also features a veranda with views of Lake Las Vegas, the 18th tee of the Reflection Bay Golf course, mountains, courtyard/pool, and the village. The living room offers comfortable seating for 4 with a Flat screen TV, dvd player, high speed internet and sleeper sofa. 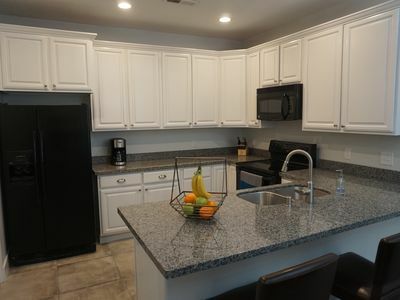 The fully equipped kitchen offers a stove & oven, microwave and full size refrigerator/freezer and granite counters.The dining area has a table with seating for four people. The oversized veranda has comfortable seating for four, a large table and a chaise lounge to relax while taking in the breathtaking views. 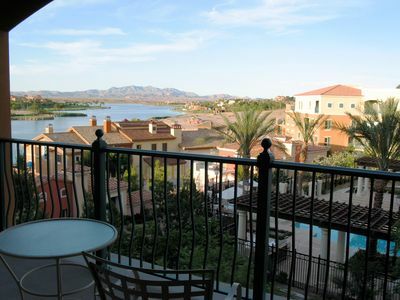 Breathtaking views of the village and Lake Las Vegas from your 6th floor condo. A five minute walk takes you to the waterfront village where you will find restaurants, a grocery store and lakefront walking trails. Water activities include kayaking, paddle boarding and boating or for those that like to shop, you're only a 10 minute drive from the Galleria Mall. A day or evening on the Las Vegas Strip is just a 30 minute drive or the 18 hole Reflections Bay Golf Course is right in your community. Enjoy beautiful sunsets by the lake or on your own private balcony. 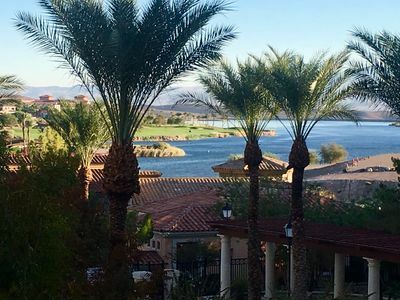 You're sure to enjoy all that Lake Las Vegas has to offer. NO HIDDEN RESORT OR PARKING FEES. Our condo is fully equipped for a 3 night or one month stay. We have a brand new king size bed in the bedroom with comfy linens and a duvet and a TV in both the bedroom and living room. The kitchen is stocked with everyday items to prepare a meal and dine in or to have a snack for lunch and enjoy one of the great restaurants in the village. We have provided a few Keurig coffee and tea pods for your first morning coffee but the Season's Grocery in the village also prepares an outstanding latte or cappuccino. We have left a couple of waters and sodas in the fridge for you to help yourself. Our wine rack is stocked with a few bottles of wine and we ask that you Enjoy a Wine, Replace a Wine! We are always interested in trying someone else's favorite flavor. We have supplied some shampoo/conditioner/lotion and soaps for your first couple of nights and there is a hairdryer in the drawer in the bathroom for your use. Tissue, toilet paper and paper towel are also supplied for short term stays. Pool towels are provided in the small cabinet on the wall behind the door in the bathroom. 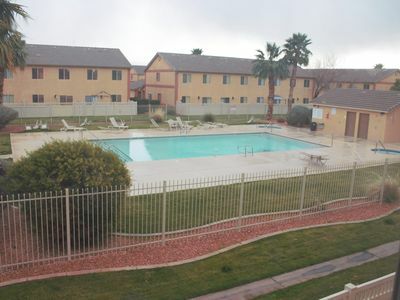 OVER-SIZED 2 BR UNIT STEPS TO POOL & COURTYARD!!! This unit boasts 1,269 square feet of living space which is 30% larger than similar units in the complex. Located on the ground floor provides easy access direct to the Viera's lush courtyard , two pools and heated spa. In addition, this end unit provides more natural light with additional windows. The oversized private patio/courtyard area enjoyed by this unit provides ample areas of sun and shade for guests to relax. The patio is east facing to enjoy the morning sun and protected from the late afternoon sun. The unit comfortably sleeps 6 with the sleeper sofa in the living area. 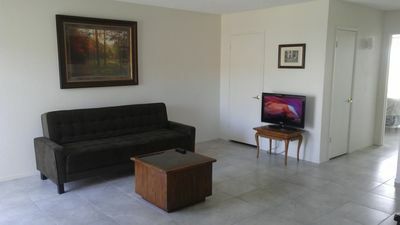 Modern flat screen televisions are equipped in each room with expanded cable services and free WiFi throughout resort. There is a combination washer/dryer unit in the unit to keep up on laundry as well as a first level Laundromat on the same level. Season's Market also offers laundry services for those who want to truly leave the chores behind while on vacation!! The kitchen is fully equipped with all the essentials needed for those times when eating in. Casual dining at the breakfast bar or more formal dining at the dining room table, the choice is all yours!!! The bedrooms are larger than the standard units in the building and have a roomy, elegant feel with the high ceilings. The bedding and pillows are all new awaiting the opportunity to provide future guests sleep comfort after a long day of relaxing!! The master bedroom is complete with a full master bath. An additional 3/4 bath provides guests with a roomy modern facility as well. The main living area is roomy and spacious boasting natural light and high ceilings, The new 50" flat screen television is surrounded by ample seating for all to sit back and watch their favorite programming. Montelago Village surrounds the Viera complex and is under revitalization with new additions monthly!! The Season's Market is a well stocked store that provides guest with all the essentials needed for a stay at the Viera. In the morning you can treat yourself to a gourmet coffee and Danish, afternoon soup and sandwich and evening cheese and prosciutto enjoyed with a bottle of wine!! It is well stocked with fresh fruits, vegetables, dairy, grocery and cleaning items. It is truly the little neighborhood store in the village with the BIG selection and variety! For the sweet tooth, there is a Rocky Mountain Chocolate shop as well as seasonal Gelatto shop lakeside. Sonrisa Grill offers authentic Mexican fare with daily food and drink specials. Luna Rossa Ristorante offers traditional Italian fare along with gourmet pizzas as well for take out back to enjoy on your patio if preferred!! A French-inspired bistro provides another dining option at Mimi and Coco's. Auld Dubliner Pub will bring the Irish out in you with all the craft beers and traditional Irish fare delectably prepared!! For those who like to take a walk before or after breakfast or lunch, the Reflection Bay Bar & Grill may be your best bet!! The leisurely 10 minute walk from your unit will get you there in time to satisfy your needs for some light fare or cold beverage. 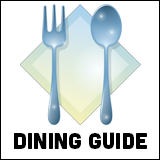 The Hilton and Westin hotels also offer dining options to the public as well. Lakeside you will find paddle boat, canoe and electric boat rentals to explore the 330 acre lake. For those who desire more water, Lake Mead National Recreation Area access gate is just a mile away. There are numerous biking and walking paths available for your enjoyment and bike rentals can be found at the Westin as well as River mountain Bike Shop at 2310 E Lake Mead Pkwy, just outside the main entrance to Lake Las Vegas. There is golf available to the public at the Reflection Bay Golf Club, recently ranked a top 100 course by Golf Digest. Summers also bring a variety of festivals and events to the village as well as weekend music lakeside. Check lakelasvegas.com to get the most current information!!! 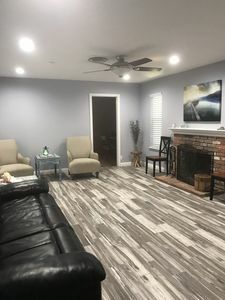 We currently own and manage another unit in the building and our reviews there should help guide you in your decision making process Homeaway #3716776. Weekly and monthly rates offered at discounted price. Please select your dates and automatic discounts will be applied to daily rates posted.